Tomorrow is Benjamins birthday. He will be 32 year's old.Happy birthday. Mazal Tov, Grattis. Here he bakes his cake with me. we are celebrating it already on sunday when he visited me. 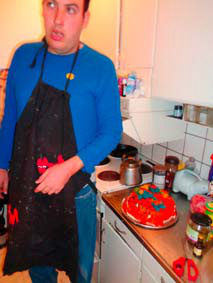 HE wanted to have an orange cake as a pumkin with three blue gnomes on that he made. The gnoms are also in the latest story we are making about the Playful monsters.He weaers also his foxes on him that he screened.